Presented on this blog are three remarkably rare letters written by a black soldier during the Civil War. Understandably, few black soldiers corresponded with their families back home because they were often illiterate. Those that did often had white officers or clergymen pen their letters for them. Not only are these letters unusual because of their rarity, but they are remarkably well-composed with above average penmanship for a private in the volunteer service during the Civil War. 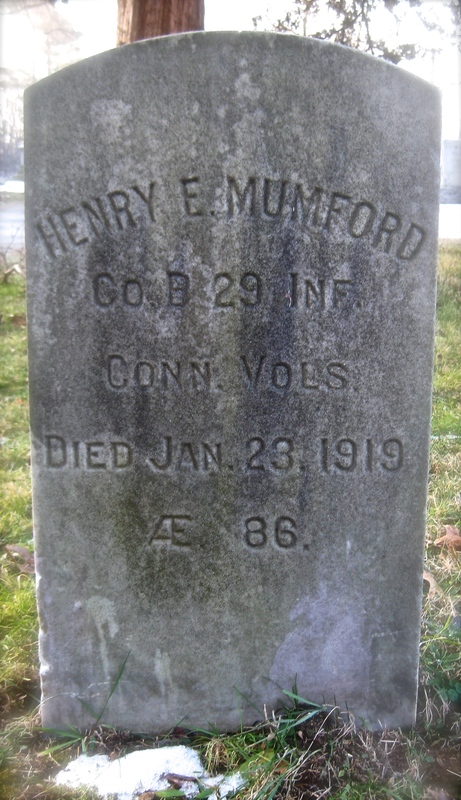 Henry E. Mumford was a private in the 29th Connecticut — one of two volunteer infantries of black soldiers from Connecticut; the other was the 30th. Blacks were first allowed to join the Union army in 1862, and President Abraham Lincoln laid down the challenge more so in the Emancipation Proclamation in January 1863. Many joined to help end slavery and to fight for their freedom, encouraged by Frederick Douglass and other abolitionists. The first recruits for the new regiment arrived in August 1863 and the last by January 1864. There were 900 black men, Native Americans and at least one Hispanic – all farmers and laborers, freed men and others who may or may not have ever been slaves – from New Haven and surrounding areas who trained in the Fair Haven section with sticks because they had no weapons yet. They finally got muskets in April, sailed for Hilton Head, SC, and then for Beaufort. There, they were consumed with “drill, picket and guard duty” for several months. They got their orders on Aug. 9 and sailed for Virginia. Joining with other black regiments and Union soldiers in Virginia, they pushed back a rebel attack at Deep Bottom. A month later, Union soldiers went after Fort Harrison, one of the Confederate defenses protecting the city of Richmond. They captured it in late 1864 and then went after the prize, but they were relentlessly repelled for months by Confederate troops. In one of the final battles for the city, the 29th lost 80 men. Confederate President Jefferson Davis, his cabinet and troops abandoned the city on April 3, 1865, burning down much of it as they scrambled out. A week later, Gen. Robert E. Lee surrendered to Union Gen. Ulysses S. Grant at Appomattox. The 29th was the first black regiment to enter the city. It does not have the proud heritage of the 54th Massachusetts Volunteer Infantry, whose exploits were chronicled in the movie “Glory” in 1989, but it did its part to topple the Confederate stronghold of Richmond. After Maryland, the regiment headed to Point Lookout, MD, where the soldiers helped guard about 20,000 prisoners of war, with stops through various cities before arriving back home in Connecticut for discharge in November 1865. 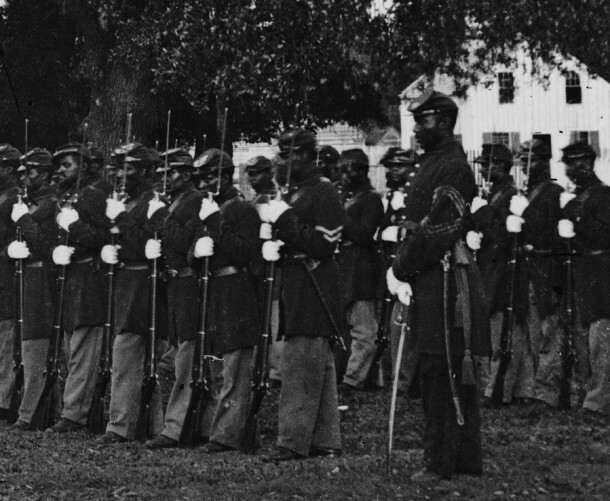 In the end, more than 200,000 blacks fought for the Union during the Civil War. Two years ago, an organization called the Descendants of the Connecticut 29th C.V. Infantry Regiment Inc. – with funding from the state – installed a monument in New Haven to honor the black soldiers. The granite monument lists the names of each of them and include plaques designed by sculptor Ed Hamilton. 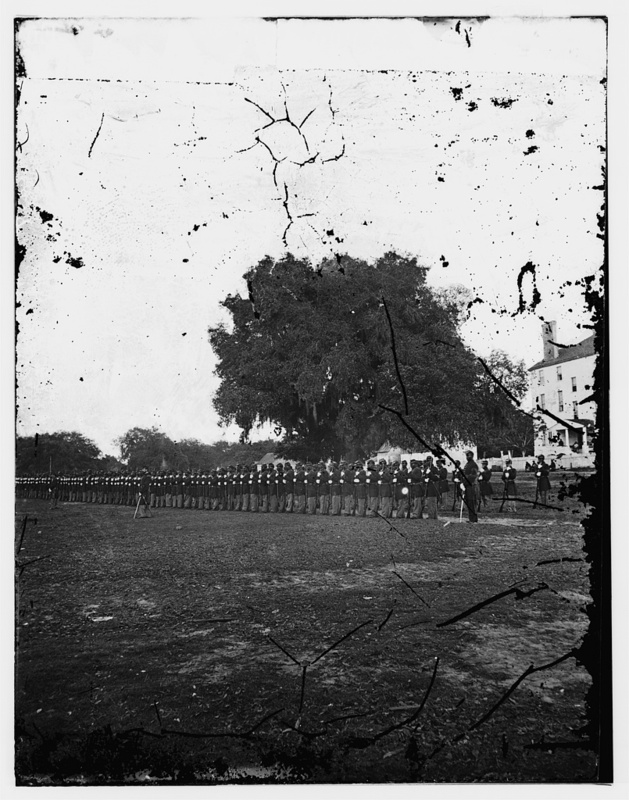 The earliest recruit for this regiment was enlisted August 11, 1863, but most of the men came to the regiment at its rendezvous in Fair Haven during the last three months of the year. The full number and more were attained in January 1864. For lack of officers it was not mustered into the United States service until March 8th. Four days after. Colonel William B. Wooster, formerly Lieutenant Colonel of the Twentieth Connecticut reported for duty and soon took command. After the presentation of a flag by the ladies of New Haven, the regiment embarked on a transport March 19th. It arrived at Annapolis, Md., and disembarked March 22d, pitching its first tents near Camp Parole. Not until April 6th was the regiment furnished with muskets, of the best Springfield pattern. The regiment was assigned to the Ninth Corps, and on the 9th sailed, on two transports for Hilton Head, S. C., where it arrived April 13th. Thence it was ordered to Beaufort, S. C., where it disembarked and encamped the same day. Here drill, picket, and guard duty occupied the attention of officers and men nearly four months. August 8th orders came to leave, and the next day the regiment sailed for Bermuda Hundred, Va., arriving August 14th. A part of the regiment was immediately sent on a reconnaissance with a portion of the Tenth Corps. Though coming under fire for the first time, the men displayed great coolness and bravery. The regiment was assigned to General William G. Birney’s Brigade, General D. B. Birney’s Division of the Tenth Corps, making, with the Seventh, Eighth, and Ninth Regiments, United States Colored Infantry, and other colored regiments, a colored division, the Third of the Tenth Corps. It was engaged In an advance at Deep Bottom, under General Butler, and repulsed a rebel attack on the 16th and 17th of August. Returning to the Bermuda Hundred front, it encamped near Point of Rocks. August 24th the Tenth Corps relieved the Eighteenth In the trenches In front of Petersburg, on the right of the place where the mine was exploded. Here the Twenty-ninth remained under constant and wearing duty until September 24th, when the whole corps was ordered to the rear for rest and replenishing its worn and scanty clothing. On the 28th It marched to Deep Bottom, and the next day, with the Eighteenth Corps, engaged under General Butler In taking Fort Harrison and a part of its connecting line of earthworks, about seven miles from Richmond. An unsuccessful but most persistent attack was made upon Fort Gilmore, the next in the line, but at evening the corps retired to the trenches just in their rear, and proceeded to turn them. The next day the enemy, with heavy reinforcements, endeavored most vigorously to dislodge them, but without success. October 7th the regiment assisted in repelling an attempt of the enemy to turn the right of the line. With the Eighth and Forty-fifth Regiments, United States Colored Infantry, the Twenty-ninth constituted the Second Brigade, Third Division, Tenth Corps. On the 13th it joined with others In a reconnaissance in force toward the right of the line, across and beyond the Newmarket Road to the Darbytown Road. There was some sharp fighting and considerable loss of men. On the 27th and 28th of October the Tenth and Eighteenth Corps attacked along nearly their whole front, in conjunction with a forward movement of the Army of the Potomac. The Twenty-ninth formed the skirmish line of its division, and drove the enemy into their works and kept them there. The men behaved admirably, remaining on the advanced line through the entire night, till relieved in the morning. It was the only regiment meeting with loss In this affair at the Kell House. Its loss was eighty. Soon after, the regiment was placed in the First Brigade and assigned the duty of garrisoning the line of forts along the Newmarket Road, a most important duty. December 5th the Tenth and Eighteenth Corps were reorganized and a corps of colored troops formed, called the Twenty-fifth Corps. The Twenty-ninth was placed in the Second Brigade, First Division, and moved into the line on the left of Fort Harrison. Here it remained during the winter, picketing, drilling, and building forts and roads, in preparation for the spring campaign. Late in March, 1865, the regiment was moved into Fort Harrison, which was supposed to be undermined and the most probable point of rebel attack. Here they witnessed the last rebel dress parade on the afternoon of Sunday, April 2d. Early the next morning explosions of rebel gunboats in the James, and of magazines in Fort Darling and in the direction of Richmond, and the coming in of deserters began to announce the rebel evacuation. The heavy firing of the two days before on the distant left across the James, and the order for extreme watchfulness, had prepared the whole division along this, the nearest part of the line to Richmond, for this result. By the earliest dawn the Twenty-ninth was in marching order and eager for the pursuit. The men were soon over the breastworks, through the bristling abbatis and the thickly planted torpedoes, and in the deserted rebel fort. They found the guns spiked and the tents standing, but with every breadth of canvas slashed by a knife. They waited to see no more, but hurried out upon the high-road to Richmond, which was strewn with articles cast aside by the retreating rebels. Then began the exciting race to first reach the burning city, the flames and smoke of which could be distinctly seen. Two companies of the Twenty-ninth, C and G, were ordered forward as skirmishers, and were the first infantry to reach the city. The cavalry scouts had preceded them and were stationed at the entrance of the city to halt all stragglers. The brigade in which was the Twenty-ninth was stationed in Batteries Nos. 5, 6, 7, and 8 of the interior line of the defenses of the city. On the 13th the regiment moved to and through Petersburg, camping near Patrick’s Station on the City Point railroad. On the 18th it marched to City Point and sailed to Point Lockout, Md., where it was engaged in guarding the general depot for prisoners of war, containing about 20,000 prisoners, until May 28th, when it was transferred to City Point to await transportation. June 10th it sailed with the Twenty-fifth Corps for Texas, touching at Mobile and New Orleans, and arriving at Brazos de Santiago July 3, 1865. Thence it marched to Brownsville, Tex., where it remained in camp until ordered to Connecticut for muster-out October 14, 1865. It waited at New Orleans for transportation from October 27th to November 11th, when it embarked for New York and Hartford, arriving at the latter place November 24th. The next day the regiment was paid and discharged. A letter from Lewis, Connecticut Historical Society; Lewis Hazard of Co. g, 29th Connecticut Infantry. 10 ItemsLetters from an African American soldier to his wife, Abby Simons Cross. Cross enlisted on 31 December 1863 and was mustered-in a Private on 8 March 1864. He was promoted Corporal on 30 April 1864 and to Sergeant on 1 January 1865. He was mustered-out on 24 October 1865. This very rare collection of letters, along with a brief biography of Cross, was recently published in The Connecticut Historical Society Bulletin, Vol. 60, Nos. 3-4. Contact the CHS store for ordering information.